Most of the 415 whales that washed up on a narrow sand spit in Golden Bay, New Zealand died by Thursday night, while scores of volunteers armed with blankets struggled to keep the surviving animals wet to refloat them during a life-saving tide. The mammals were scattered along the beach in Farewell Spit on the northwestern coast of New Zealand’s South Island, near the settlement on Puponga. Hundreds of volunteers joined the rescue operation, led by the New Zealand Department of Conservation. Gruesome images showing piles of dead mammals lying mere meters from the water have emerged on social media. About 30 medics have been dispatched to the site of the stranding to take care of the whales joining the efforts with volunteers in keeping them cool and comfortable and preventing the refloated whales from coming back ashore with impromptu “human chains.” The call for help, posted by Project Jonah of Facebook, has seen a tremendous response from locals, with a road leading to the beach being jammed with cars of helpers, the New Zealand Herald reports. “This is quite emotional – it’s encouraging to see the number of people who have come out to help … We’re going to give these whales the best chance we can,” said Louisa Hawkes, of the Project Jonah environmental organization, as cited by 1 News, which is running live updates on the large-scale rescue operation. Messages of sympathy and support have been pouring in on Twitter in response to the tragic scenes. While the majority of nearly a hundred pilot whales were successfully refloated on Friday morning, there is a high chance that the same whales could get stuck again. “What they’re doing is milling around so we won’t know until mid-afternoon whether we’re going to have a restranding or not,” Andrew Lamason, DOC Golden Bay operations manager, said as cited by Stuff. As of Friday afternoon (local time), the whales have been spotted returning back to the beach, with some of them getting caught in the sands again. 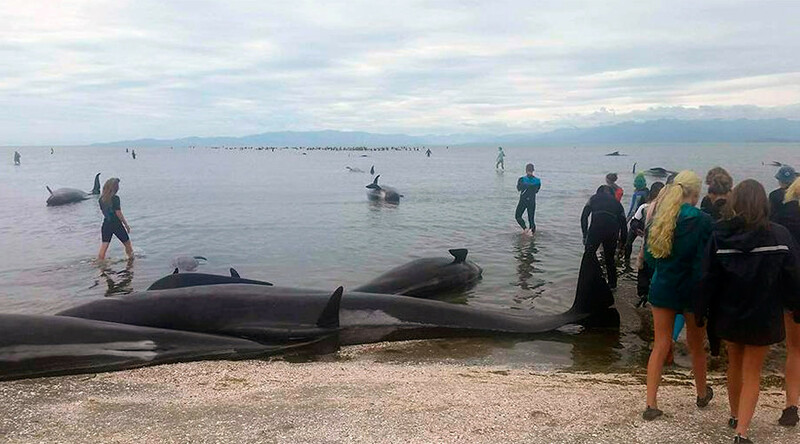 The current stranding become the third largest in the recorded history of such events in New Zealand. The biggest stranding, which saw around a thousand sea creatures beached on the Chatham Islands, dates back to 1918. The second largest occurred in Auckland in 1985, when some 450 whales ran ashore. The Farewell Spit has been known as a notorious trap for the mammals. Last February, about 200 pilot whales got stranded on the beach there.